When it comes to managing your website, there is no finish line. Sure, nothing beats the feeling of clinking glasses and raising a toast to your newly launched website that looks fantastic. But a few weeks or months later, many businesses find themselves asking the same question: Where is all the traffic? Building a website is only one step in the long journey of maintaining a successful, high-impact website. Joining forces with a top search engine optimization (SEO) company can help your business continue to grow and earn more revenue. But what exactly is an SEO company? What do they do? How can you find the right one? These are all very common questions. SEO has grown in popularity over the years as a marketing channel, but it’s often a tough strategy to grasp for those not familiar with digital marketing. In short, the definition of an SEO company is a company that partners with businesses like yours to boost your visibility in search engines. Increased visibility in search engines means more traffic coming to your website and — ultimately more leads, phone calls, and sales. With Google receiving 40,000 search queries every second on average, investing in increasing your organic search visibility can pay big dividends. Let’s explore in more detail how SEO companies work and specific action items they may take to optimize your site. Every SEO company is unique, but worthwhile companies have a similar goal: to help grow your business. At the end of the day, an SEO company’s job is to partner with you to drive leads, phone calls, store visits, purchases, and more through search. Just like you hire an accountant to help streamline and improve your books or hire a cleaning company to tidy up the office each week, partnering with an SEO company means you are connecting with a company whose goal is to improve your visibility in search engines. Let’s say you operate a house painting company in Ames, Iowa (Go Cyclones!). You are an expert in all things paint. You spend your day talking all about glosses, finishes, ferrules, and more. 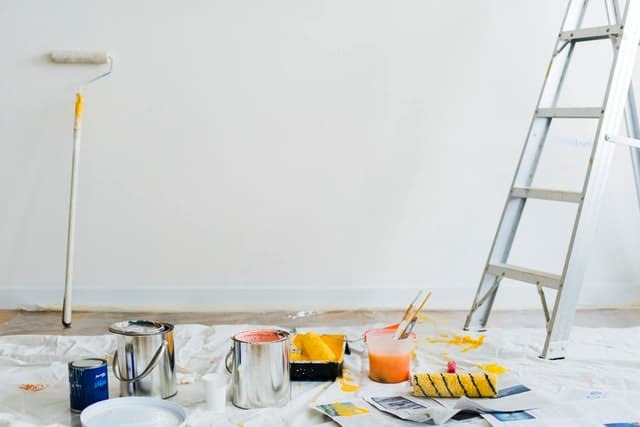 You want to earn more leads for your business and hear from your customers that they find local paint contractors through search engines like Google. Taking the time to learn, implement, and adjust an SEO campaign isn’t an option for you. So, you find a trustworthy and reputable SEO company to help manage your web presence in search engines. A few months later, your site starts showing up at the top of Google results for searches like “painters in ames iowa” and “exterior painters in ames.” A beautiful partnership is born! You are busier than ever thanks to leads flowing in from search engines. Partnering with a quality SEO firm gives you the expertise needed to generate more business from organic searches. One nice plus of working with an SEO company is that traffic coming from organic (unpaid) search in Google tends to produce very high-quality leads. The beauty of SEO is that your marketing efforts allow interested customers to find you online. Most marketing channels require businesses to blast their message out to thousands of customers, with the hope being that a small percentage of them will be qualified prospects. SEO works in the opposite direction: you make it easier for people to seek out and find your business as they search online. By nature, leads you earn from organic search are self-qualified. This means people who are already interested in your product or service are looking for you. At WebFX, we track all leads coming in from a website with our free marketing automation software MarketingCloudFX. We see amazing leads all the time from many channels, but in the long run, leads coming in from organic search tend to be the highest quality because it allows interested customers to seek you out. We’ve talked about what SEO companies are and how they work. But how exactly do they go about achieving increased visibility for clients in organic search? While many SEO companies are hesitant to talk about what they do day-to-day, we take the opposite approach at WebFX. We offer transparent pricing for all of our services, so before you even call, you know how much services cost and specifically what is included in each plan. You can browse our SEO services to get an understanding of what our SEO company does for clients and the results we drive. While much of what we offer is unique, there are a lot of common tactics and action items between different SEO companies. The ability to execute on these and the levels of effectiveness may differ, however. How well is your website performing currently? What is working well for competitors in your industry? What keywords do you target audiences search for? What are reasonable results to expect given your SEO budget? Are page titles and meta descriptions optimized? Is your website content clear, concise, and SEO friendly? Do you talk about your services and value-adds using the right language? Are pages optimized for the proper keywords and themes? Is your website earning links and mentions around the web? Does your server configuration work properly? Is your website secure and providing a good UX? How often will you get SEO reports? What is included in SEO reports? What are your agreed-upon campaign goals? How is your SEO company regularly keeping up to date with business changes? What are existing content opportunities for your site? What type of content works best for your target market? How can we ensure content is SEO friendly? Does the website content contain strong calls to action? How can we leverage data to make decisions? What areas of the site can we A/B test? What key power phrases drive visitors to take action? What are new/upcoming areas of opportunity? These six areas provide an overview of key focal points for many SEO companies and some questions that you should be discussing regularly with your SEO partner. While our six key points are helpful, no campaign can be boiled down to a simple list — and successful SEO campaigns require continual optimization to drive the best results. You can always capture more traffic and increase the conversion potential of existing site traffic. 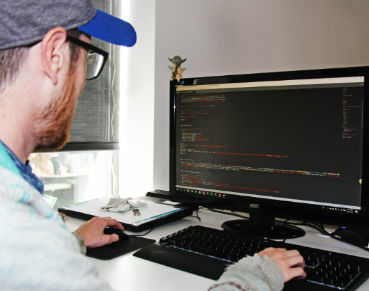 A good SEO company will have a strong follow-up process that allows for constant testing, adjusting, and tweaking to the strategy behind the campaign and to your website. Our experience shows that, on average, most companies redesign their websites every three to four years, so view the pages on your site as a living document. Search patterns in your industry are constantly changing, and your SEO campaign needs to remain as agile as possible. Be sure to find an SEO company that can move as quickly as your business does. 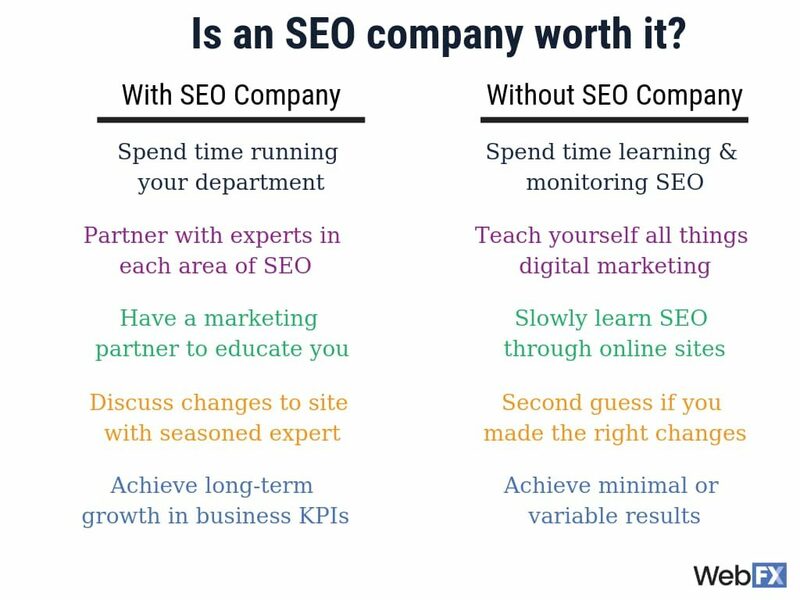 If you are thinking about partnering with an SEO company, you’ve thought about the obvious benefits already: more qualified website traffic, leads, and revenue. While those are key, overarching benefits, there are plenty of other tangible benefits of working with an SEO company. We’ve worked on SEO campaigns across hundreds of different industries over the last few decades and have seen a lot of similarity across our client base with unexpected benefits of our partnership. Don’t just take our word for it. Check out this SEO case study to learn how we grew organic traffic for a local construction company by 43 percent. Now that you are familiar with what an SEO company does, how do you go about researching and choosing the best SEO company? Good news! You have already taken a crucial first step: familiarizing yourself with SEO. Feel free to use some of the questions above in your early discussions with potential partners. It can be very difficult to vet SEO agencies if you know very little about what they do. Having even a speck of understanding can help you ask good questions and give you an idea of what to look for in an SEO company. Look for firms with a strong track record: Agencies with ample customer reviews, case studies, and verified reviews on third-party sites give you a window into how happy their customers are. Look for firms with experience in your industry: Have they worked with similar websites before? What results were they able to achieve? Do they speak knowledgeably about KPIs and industry-specific information? Look for firms that align with your campaign goals: Be clear and firm on what business goals you have for your SEO campaign. This is very helpful for a good SEO company, and they can craft a strategy that will get you there. Want more leads from your website? Find a firm like WebFX that specializes in lead generation through SEO. Finding that right SEO company for your business that has proper alignment with your business can change the trajectory of your company. Organic search is a powerful marketing channel that continues to grow. Being educated about what an SEO company does and how to find the perfect one for your business is crucial in today’s rapidly changing advertising landscape. If you are interested in learning more about how SEO can fit into your marketing mix, contact us online or give us a call at 888-601-5359.